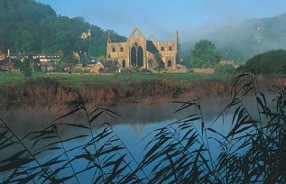 Tintern is famous for its abbey and for the poets and painters such as Wordsworth and Turner who visited it two hundred years ago in the Romantic period. It is indeed a wonderfully romantic place, lying on the Welsh side of the winding valley of the River Wye between Chepstow and Monmouth. But it also has a fascinating history which is not often known to the many visitors who come here to enjoy its picturesque beauty. The River Wye has been a major thoroughfare from the Roman times, and it is said that the Viking longships rowed up the river as far as Monmouth. With the roads in the area made difficult by the hilly terrain, in more recent centuries the Wye has been a busy commercial waterway carrying coal, wood, charcoal, iron ore, and stone, and there was regular trading with Bristol. The main vehicles in the river trade were flat bottomed ‘trows’ which could weigh up to 100 tons, and the remains of various wharfs can still be seen along the river. Fishing has always been important, too, and at low tide various weirs become visible along the river which were built to trap fish. During the mediaeval period there were prolonged struggles between Welsh Princes and English Kings, and a famous battle was won in 1404 by the Welsh Prince, Owain Glyndwr at Craig y Dorth about seven miles away on the southern outskirts of Monmouth. By the time of the Norman conquest of Britain in the 11th century Tintern was a remote and rather desolate place, and it was these qualities which attracted a group of Cistercian monks from France. The Cistercians, who were an offshoot of the ancient Benedictine order, were expanding rapidly in this period, and they brought with them the ideals of the simple life of spiritual discipline and of hard work (The motto of St Benedict was: ‘Laborare est orare’ – ‘To work is to pray’). The life of the monks was hard, though perhaps not conspicuously so by comparison with the standards of the day. The daily routine, which began at 1.30 a.m. in the summer, comprised eight periods of chanting and prayer in the abbey church, with intervening periods of work and study. The two daily meals were vegetarian, though meat and fish were allowed for the sick and the old. The abbey church itself was built twice over. The first, which was modest and simple in accordance with the ideals of the order, was constructed in 1131, and the activities of the abbey helped to regenerate the area and to encourage the growth of local economic life, particularly in the Angiddy Valley which branches off the River Wye near the abbey. The religious life of the village was served by both St Mary’s church, Chapel Hill (the remains of a Victorian rebuild can be seen on the hill above the Abbey), and St Michael’s in Tintern Parva. The second abbey church, of which you see the remains today, was built a couple of hundred years later on the same site. It is a much grander structure with soaring gothic arches, windows with delicate tracery, and surrounded by substantial outbuildings including the cloisters where much of the life of the abbey community took place, chapter house, library, refectory, dormitories, and infirmary. It housed over a hundred choir monks, who were ordained priests, and lay brothers who did the ‘housework’. Many local people were employed in building and agricultural work. Following Henry VIII’s dispute with the Pope over his divorce, the dissolution of the monasteries (of which there were nearly a thousand in Britain at that time) was begun in 1536, and the buildings and land of Tintern Abbey were granted to Charles Herbert, Earl of Worcester. The remaining monks, twelve in number, were pensioned off. 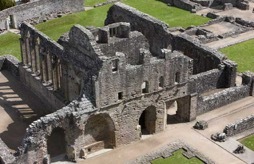 The neglected fabric of the abbey crumbled away over time and much of its stone fabric plundered for local construction work. The closure of the Abbey in 1536 might have signaled a steady decline in Tintern’s fortunes, but matters improved dramatically in 1568 when the first brass works in Britain was established in Tintern by Queen Elizabeth as a monopoly for the production of cannon and wire. Shares were held by Herbert family and by Sir Francis Bacon, philosopher and Lord Chancellor of England under James I.